Martin Creed, Giorgio Griffa and Tatsuo Miyajima are artists whose work explores ideas of chance and order, of the apparent chaos of life and man’s efforts to make sense of it. Looking at time, space and infinity, the works in this exhibition search for order while at the same time they accept fate and serendipity. 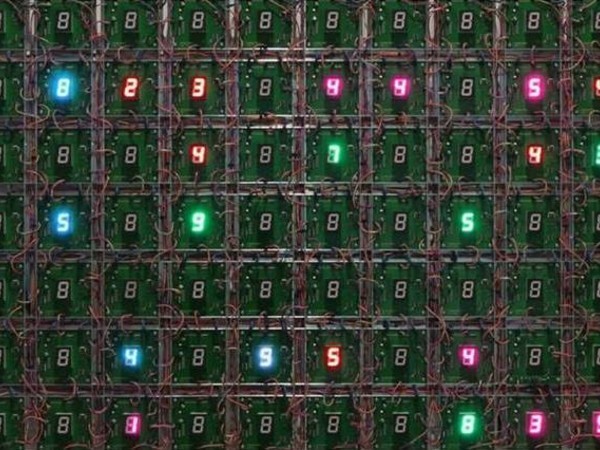 Profoundly influenced by Buddhist philosophy, Japanese artist Tatsuo Miyajima (b. 1957) uses LED counters, set at differing speeds and never showing a zero, to make installations that express the interconnectivity of everything. The Italian painter Giorgio Griffa (b.1936) believes that the rhythms of the universe – he includes those of music, poetry and mathematics - are cornerstones of his practice as a painter. In using these rhythms he accepts the inspiration of the moment, the blurring of colours, the draw of the brush, the incidental fold of the canvas – which for him are metaphors that contain a powerful fusion with reality. A great musician (as well as a self-professed algebra lover) Martin Creed (b. 1968) often makes work using a compositional rule as an attempt to create order. His paintings and sculptures employ principles of organization - such as arranging shapes or objects by typology, colour, or size – in an effort to give structure to the chaos of life. Rhythm, repetition, and incremental changes, all play an essential role in Creed’s work as an artist and as a performer.